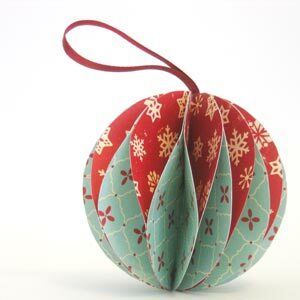 Looking for Christmas ornaments to make and decorate your house with this Christmas? 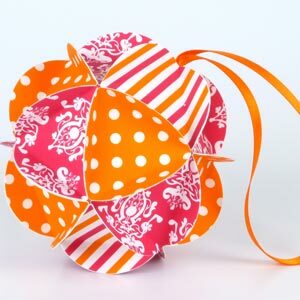 On this page you'll find step-by-step photo instructions for how to make intricate woven paper balls. 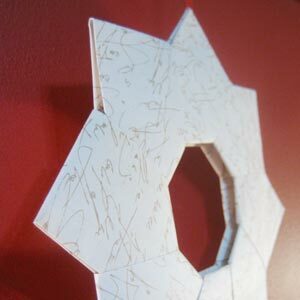 Slightly trickier than the other easy to make Christmas decorations you'll find on this site, but well worth the effort! I found a nice tutorial for the weaving method here , and modified it slightly. I find it easier to join the strips with double-sided tape rather than interlocking slits. Also, for this tutorial I used all different coloured strips, so that it's easier to see the way that the strips overlap each other. Cut 6 thin strips of card. 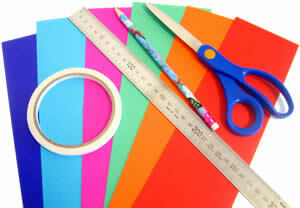 Each strip should be about 3/8 inches (0.5cm) wide, and 12 inches (30cm) long. The exact dimensions don't matter too much, so long as all the strips are the same size. 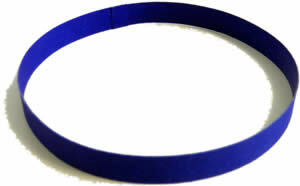 Take one of the strips and glue or tape its ends together to make a loop. Set aside. 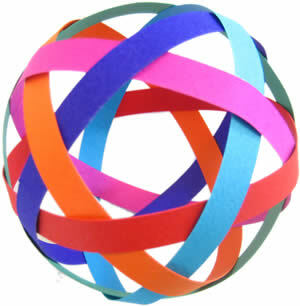 Arrange the other five strips into a pentagon. 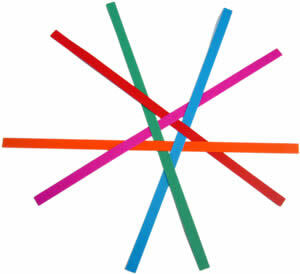 Each strip alternates over and under its neighbours. It's easiest to focus on making the little pentagon at the center first, then rearrange things to get the overs-and-unders correct afterwards. 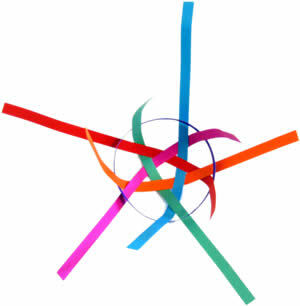 Put the loop on top of the pentagon, and poke every second loose end through the loop. The ends to poke through are the ones that last went "under" at the outermost crossing . You might find that the loop tries to spring away - the trick is to keep holding it down as you thread the loose ends through. Join the loose ends together, one by one, making sure that they alternate under and over other strips that cross their path. It's a little tricky the first time you do it, but take your time, and just think under, over, under, over... and you'll get it right. 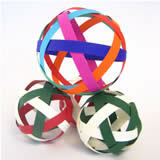 When you finish, your ball should like this, made up of triangles and pentagons. Now add a ribbon and it's ready to brighten up a Christmas tree!